Get together, hang out together, we're here to experience some wild moments - treks that strengthen our sense of solidarity. 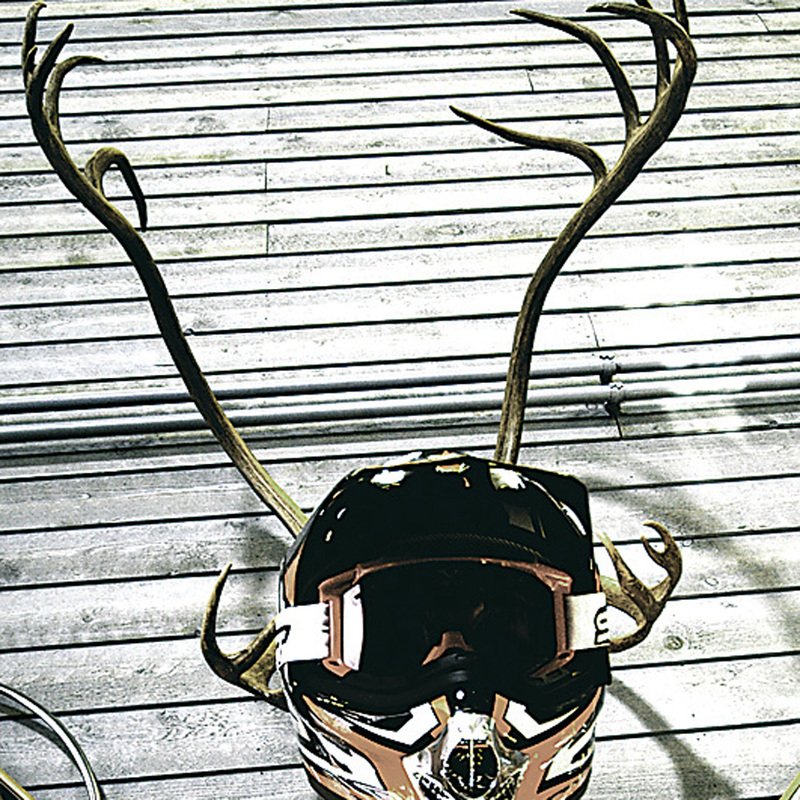 You’ll have a fast-paced and intoxicating holiday, spiced with wild woodland, speed, daring and passion. The best thing is that we have good vehicles and safe, highly experienced guides. The most enjoyable is the wondrous nature and services planned in advance to the finest detail. 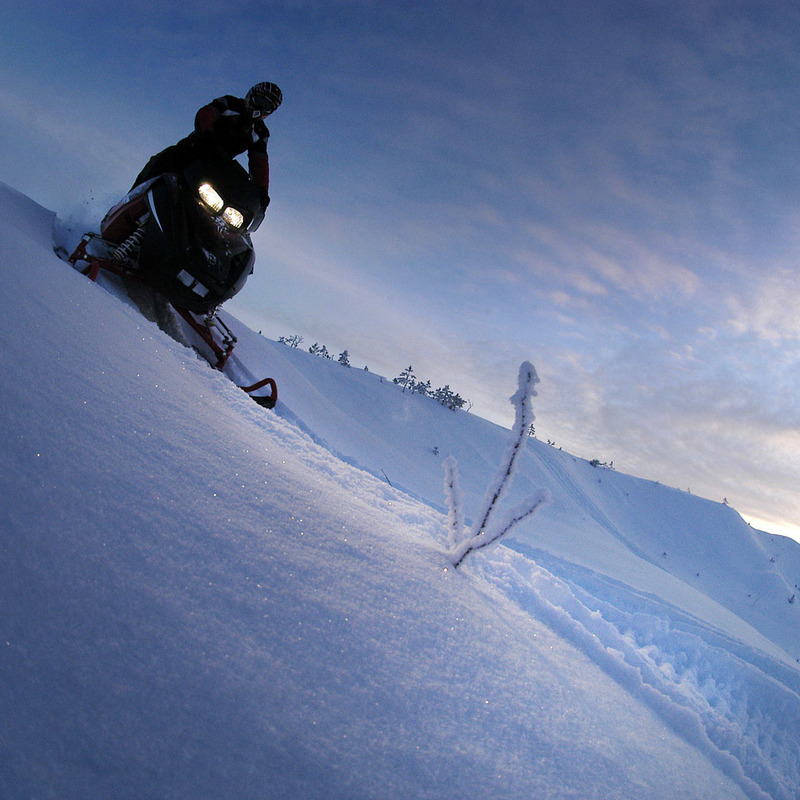 Explore our delicately planned snowmobile safaris below or ask for a custom tailored safari to meet your specific needs. Guide will have a big sledge on his snowmobile. Daily safaris start at Enonvene office every day at 10 am and 2 pm. 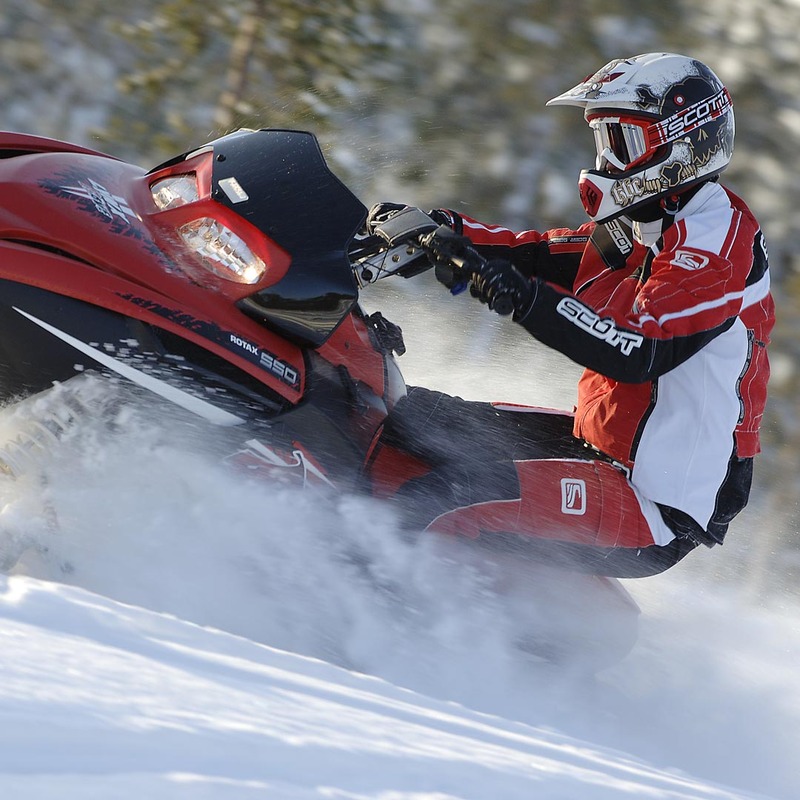 Safaris will start at Enonvene office where the guide helps you to know the snowmobiling rules and how to drive a snowmobile. Clothing and other equipments are included in safaris. The length of the 1 h safari is 20 km (starts at 10 am) and 2 h safari is 40 km (starts at 2 pm). We rev up our engines and speed across fields and through the wilderness until we arrive at the old log cabin named Hanhipirtti by the peaceful lake Pyhäjärvi. In the cabin we´ll enjoy real, tasty and from pure raw material made home food by the warmness of the fireplace. We guarantee you’ll be hungry, and the friendly host couple in the cabin have the power to fill you with the flame-grilled delights. 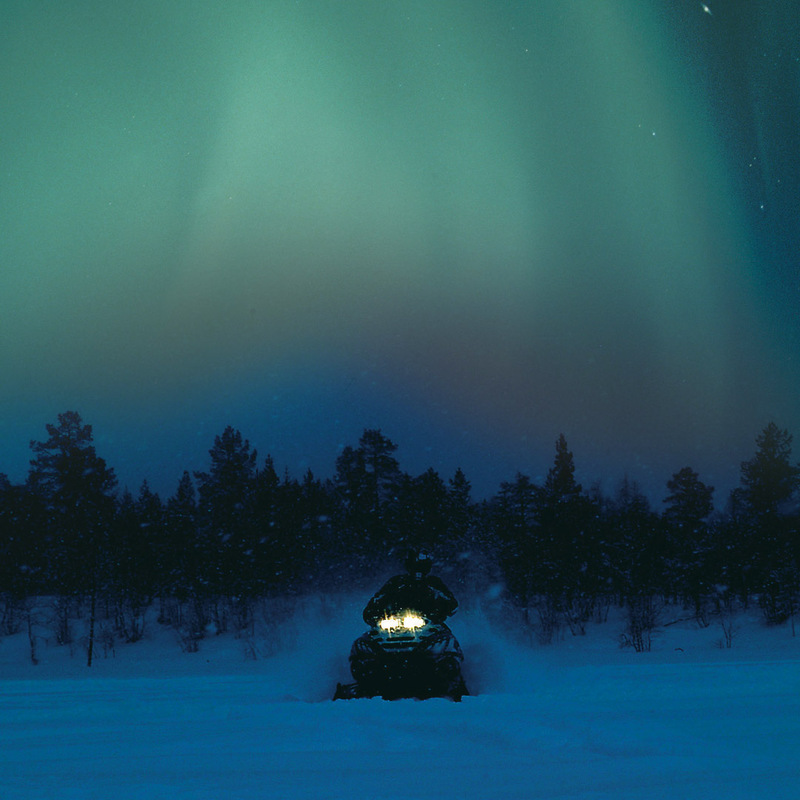 This safari immediately fills your senses with the sights and sounds of Lapland. We roar and rumble towards an old reindeer farm in Levi’s Lapinkylä village. We take a coffee break at the Harjupirtti Cabin, where the atmosphere is a true throwback to old Lapland. If you wish, you can enjoy a lunch of Lappish salmon or reindeer soup at a price of 20 eur per person. Even when you’re driving really fast, it’s always worth slowing down, when you come across some truly great scenery. And there’s certainly plenty of that to spare on this safari! We drive through snowy forests, spruce-covered bogs and over frozen lakes. Ever higher we rise until we reach the summit of Ylläs Fell. Come and marvel at the star-lit fells! The purpose is to circumnavigate Levi Fell and see all its best sides. Then when we proceed over the summit, we also get to take in some amazing scenery. This is the true fascination of Lapland. And we get more of it, when we stop by a fire to enjoy some traditional Lappish ‘black pot’ coffee. Salmon- or reindeer soup may also be tasted on the journey. 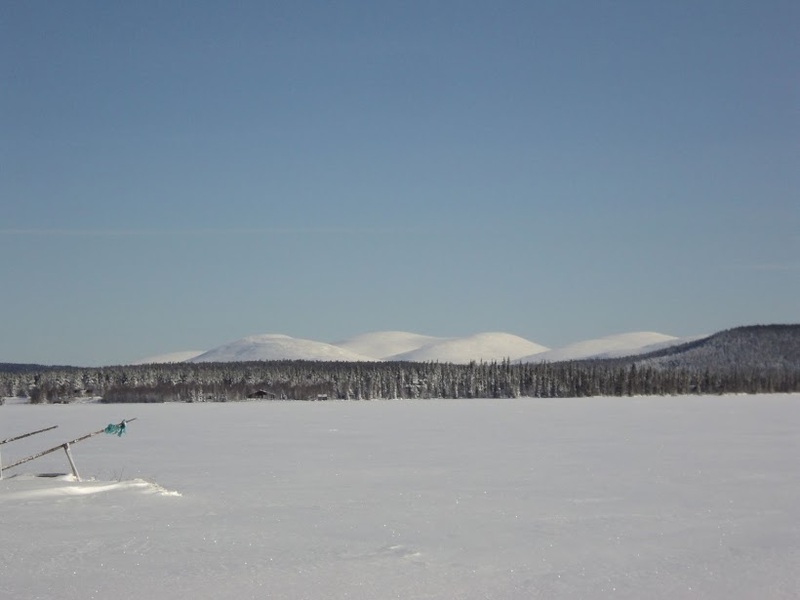 You will drive by snowmobiles to a lake, on a curved trail in a snowy forest and arrive to try ice fishing. There you'll change the snowmobile to ice fishing equipments and get also some tips for the fishing technique.Try to catch your meal, e.g. perch by ice fishing! In case you are not lucky, the host of the lake has promised to cook delicious soup by the fire of his kota by the lake. After the lunch you will drive back to town with the snowmobiles. 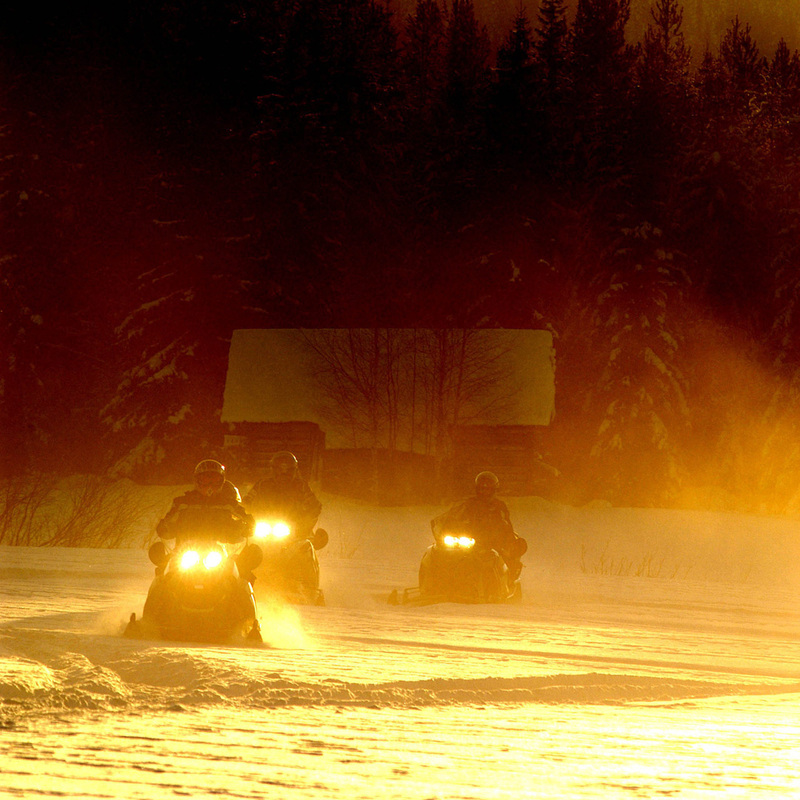 The snowmobile safari continues round the fells and back to the Levi center. 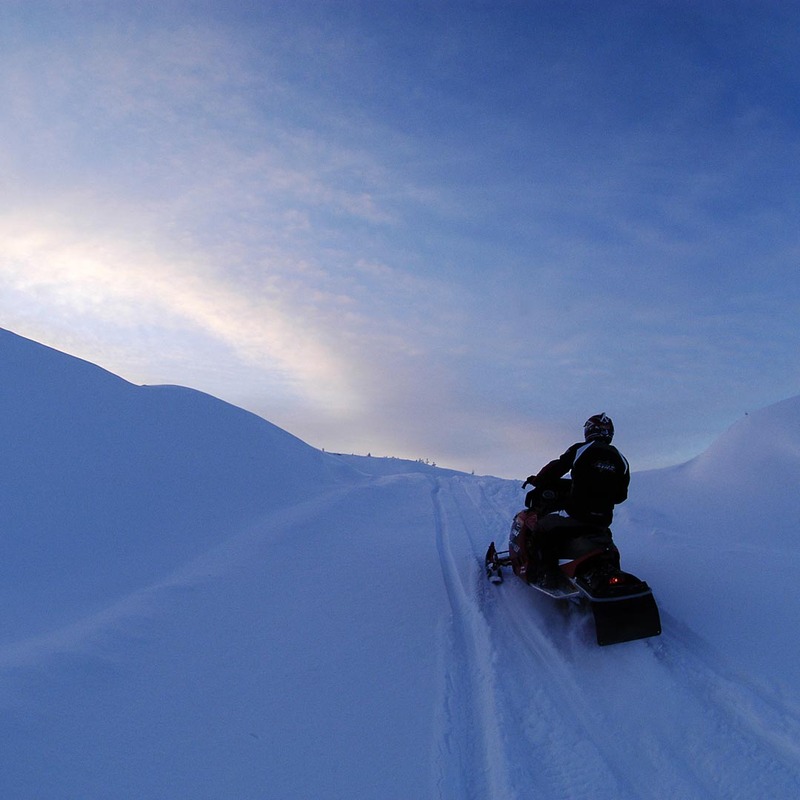 Snowmobile through the fells towards the husky kennels. 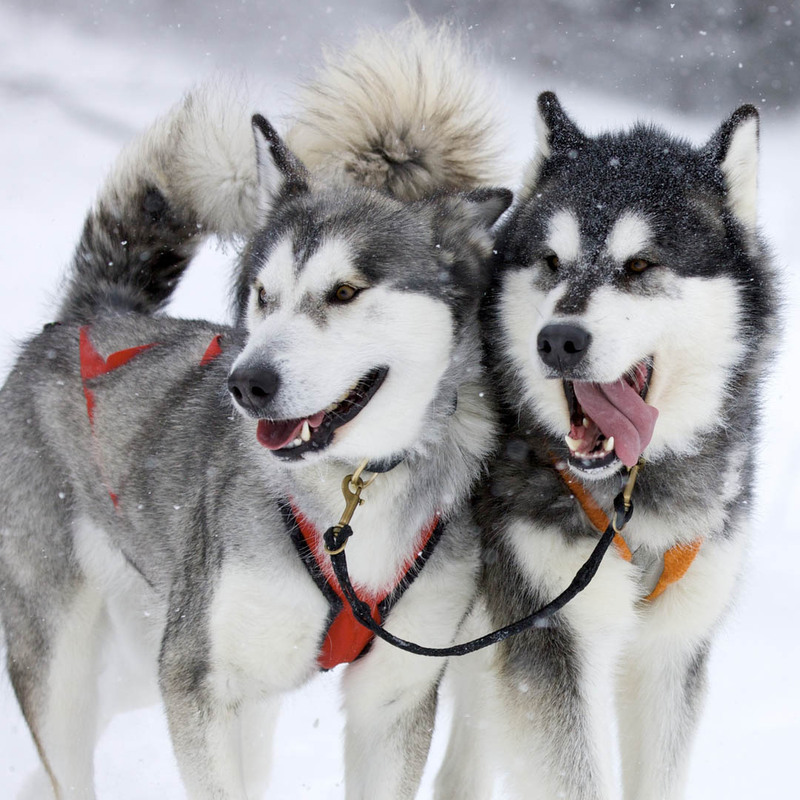 Get to know the nimble-pawed, intelligent sled dogs and learn about how they are bred, reared and trained. Also experience how it feels to be on a sled safari pulled by living creatures, when the roar of the car engine is replaced by the whoosh of sled runners and playful barking. Veterans joke that the most difficult part of driving a team of dogs is getting them to stop, especially if you’ve fallen into a snow drift – and the funniest is recounting your experiences clasping a glass of ‘hot toddy’ as a storm whistles through the nooks and crannies. We rev up our engines and head off through the wilderness towards the Ounasjoki River. 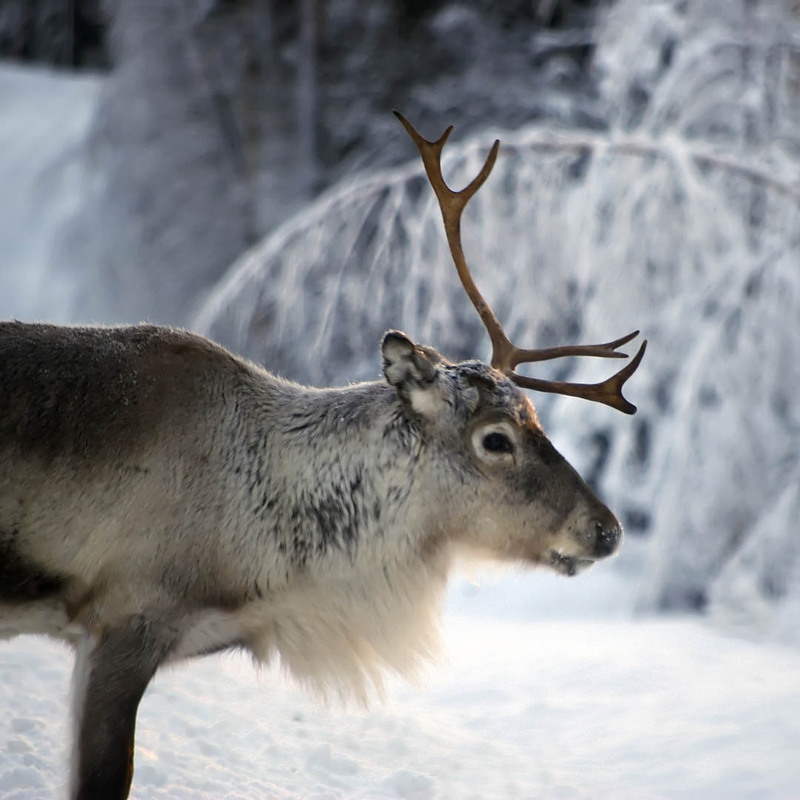 We reach the Ounaskievari Reindeer Farm, where we dismount our snowmobiles and take up the reins of the reindeer. We get a little taste of how the might of the reindeer reigns supreme in the bogland! After the ride, we take coffee in the Ounaskievari Cabin. After that we head home much the wiser. The scenery at Jerisjärvi Lake near Muonio is said to be strikingly beautiful and wonderfully relaxing for the busy folk from the south. The drive is also interesting and varied. There are high fells, flat open lakes and rugged forests deep in snow. The scenic restaurant of the Jeris Hotel awaits us at our destination. From its award-winning menu, we can enjoy such delicacies as Jerisjärvi whitefish. 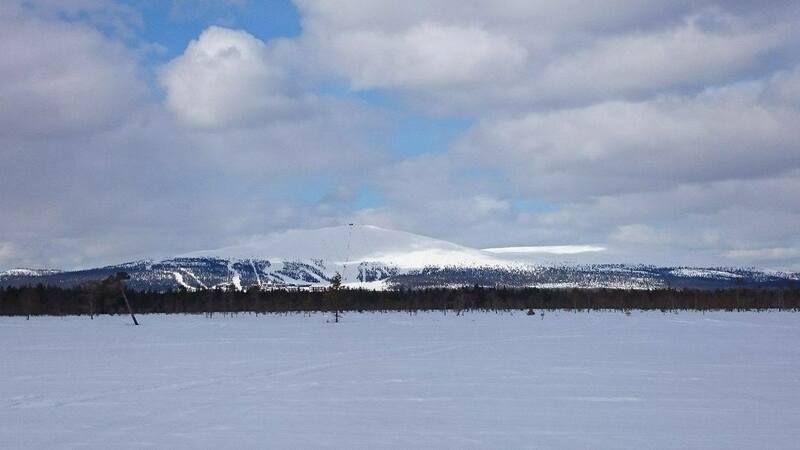 East of Levi lies the 581 m-high Kumputunturi Fell, one of the highest undeveloped fells in the area. A fire patrolman or two used to be on duty at its summit, and their fire patrol pavilion is still standing. To reach our destination we traverse aapa bogland, frozen rivers and we slalom between the trees. And then we eat. 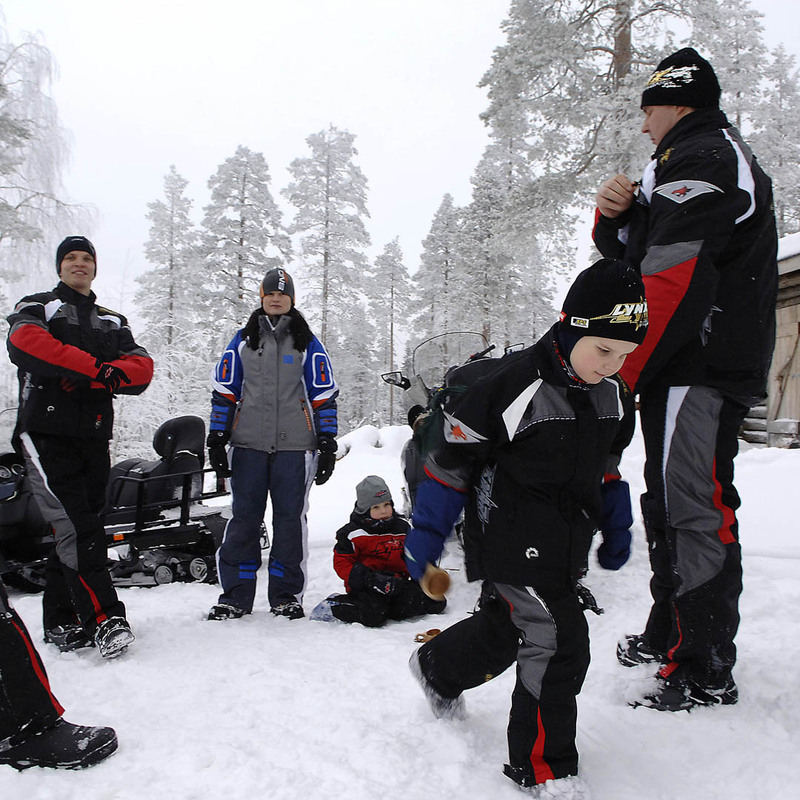 On a snowmobile ride, you can work up a huge appetite, which can be satisfied by cooking over a glowing village fireplace or a campfire in the wilderness, just like real reindeer herdsmen do. Snowmobile safari to the kingdom of snow and ice, Lainio Snow Village. Each year, around 1,5 million kilos of snow and 300 000 kilos of crystal clear natural ice are used to build the magical Snow Village which has a different theme yearly. 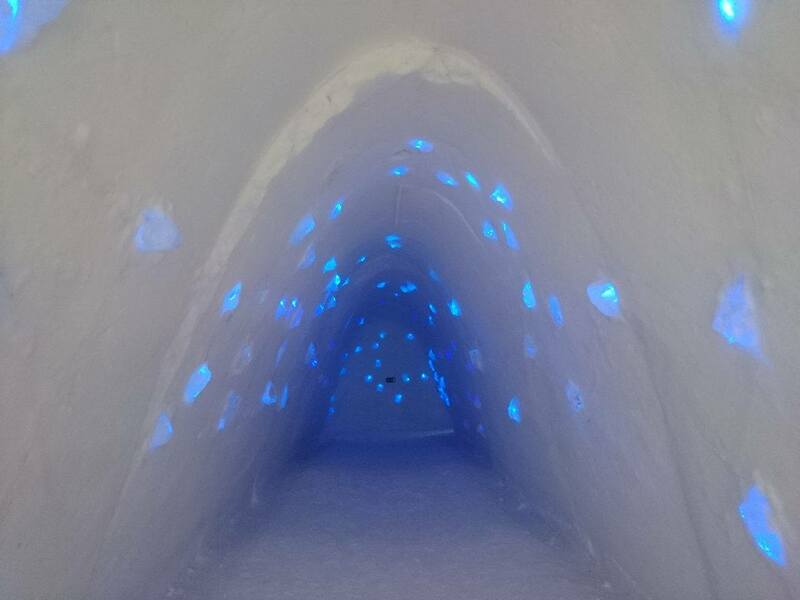 Covering an area of about 20 000 square metres, the SnowVillage consists of a snow hotel, with snow rooms and suites, Ice restaurant and -bar, Chappel and a slide for the kids. In the Snow Village, you can enjoy some hot drinks or if you feel very hungry after the drive, then naturally have a lunch there. If you start to feel sleepy, then just choose the most appealing room for you and lay down, continue your voyage on the next day. Tell us about your dream safari and we'll make it happen! In addition to our delicately planned snowmobile safaris, we can arrange a custom tailored safari to meet your specific needs. Just let us know how would you like your safari to be served and we'll make it happen.